Description: This detail is from an 1802 hand-colored map of North America showing the various explorations and discoveries of the time. The map also indicates territories claimed by France and Spain. Relief shown by hachures. 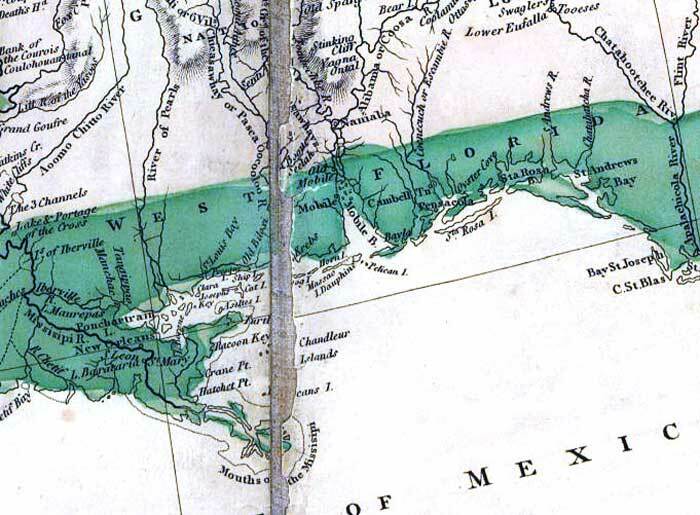 This detail shows the Spanish territories of West Florida, which covered the Gulf Coast from the Apalachicola River to the Mississippi River at that time. The map shows coastal features, major rivers, and settlements. The full title of the map is: "A map exhibiting all the new discoveries in the interior parts of North America / inscribed by permission to the honorable governor and company of adventurers of England trading into Hudsons Bay in testimony of their liberal communications to their most obedient and very humble servant A. Arrowsmith, January 1st 1795."